The Chapel of St. Theresa-the Little Flower is a church located at 58 Parsons Street in Detroit, Michigan. It is currently known as St. Patrick Church. The building was listed on the National Register of Historic Places in 1997. 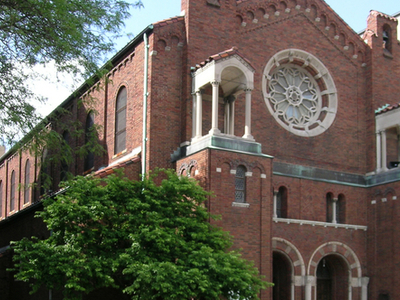 St. Patrick Parish began in 1862, in response to the influx of Irish Catholics into Detroit. The parish built a chapel on Adelaide near John R Street, which was eventually expanded into a church. St. Patrick's became one of Detroit’s largest and wealthiest parishes, although the church was never one of Detroit's largest or most impressive. In 1890, the church was named the cathedral of the diocese and was renamed in honor of Sts. Peter and Paul as the prior cathedral church on East Jefferson had been. Bishop Caspar Borgess gave the old Sts. Peter and Paul to the Jesuits in 1877 after he moved to the new cathedral. In 1892, to serve the children of the community, the Sts. Peter and Paul Academy was built on Parsons west of Woodward, which was some distance away from the main church. Here's the our members favorite photos of "Churches in Michigan". Upload your photo of Chapel Of St. Theresa The Little Flower!